Reliability Rating b / y car TUV Report 2016. At the beginning of November 2015 the German «technical control and supervision of the Union» (TUV) introduced the «2016 by TUV» public court next rating, showing the degree of reliability of second-hand vehicles over two years of age. According to tradition, originally, «public rating» is available in a format «TOP10-LAST10» and already in 2016 published its full version. In the framework of the German experts examined the technical condition of the order of 9 million vehicles in five age groups (all in the report got 223 popular models), and then revealed the percentage of «iron horses» that are right the first time «failed» with a tour of the presence technical problems. In the age class 2-3 years unconditional leadership seized the Mercedes-Benz cars, which occupied all the «podium». In the first place settled hatchback B-class, the owners of which only 2.8% of the time required to contact the service centers for the elimination of technical faults, and followed him settled crossover GLK and SLK roadster with the results of 2.9% and 3.1% respectively. The worst situation at the Chevrolet Spark (14.6%), Fiat 500 (14.1%) and Fiat Punto (13.3%). At the age of 4-5 years old segment showed itself best Audi A1 with the index of 5.7%, which was ahead of BMW Z4 0.3% and the Audi Q5 0.4%, ranked second and third place respectively. But there was an obvious outsider Dacia Logan, which failed to pass inspection in 28.1% cases. Slightly better proved to Fiat Panda and Dacia Sandero — 23.3% and 22.8%, respectively. «Palm» in the category of 6-7 years old went to the Porsche 911, which has only 8.9% «marriage.» Just gave him the reliability of Toyota Prius with the result of 9.6%, and in third place settled Volkswagen Golf Plus, which in 10.3% cases, was forced to attend the garages. Do not envy while owners Chevrolet Matiz, Dacia Logan and Renault Kangoo, whose cars took up 34.6%, 32.9% and 31.4%, respectively. In the age class 8-9 years again excelled the Porsche 911, which is only 11.7% cases had technical problems. At 1.4% of it behind Toyota Prius, and in 3.4% — Mazda MX-5. The most unreliable car was Renault Kangoo and Kia Sorento, scored 35.1% on «marriage» and the Renault Twingo to the index 34.6%. The leading position in the segment of 10-11 years again won the Porsche 911, which is only 13.9% of cases the problem delivered to their owners. 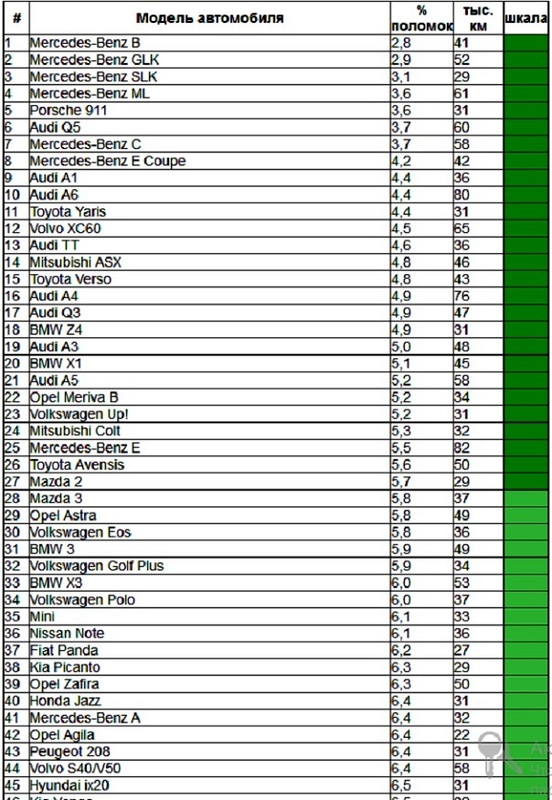 «Silver» has got Toyota Corolla Verso with the result of 17.5%, but Toyota RAV4 had to settle for «bronze» — 18.7%. On the opposite end of the rating «has registered» Fiat Stilo, Mercedes-Benz M-class and Ford Galaxy — 44.0%, 43.7% and 41.8%, respectively. «TUV 2016″ report is very valuable for Russian motorists, because within it the Germans are working with cars in the European specifications, which are generally (with minimal changes, or no changes) are implemented in our country. TUV 2016 reliability rating for the car at the age of 2-3 years.